Genesee County Clerk-Register John Gleason is spearheading a campaign to remove Norwood Jewell's name from the property of United Auto Workers' halls both at the local and national level. Gleason's grandfather is mentioned on a plaque at Michigan's Sitdown Striker's Monument. He said it's an insult that Jewell, who pleaded guilty to corruption charges, should grace the same monument. His portrait remained on display in local UAW offices following the news. "Norwood Jewell's name can't be found anywhere in the International but now we need to remove from the Locals," Gleason, a former UAW member, said. Gleason has helped launched a petition calling on the UAW to expunge his name from the monument, his portrait from local union halls, and his name from other commemorative records. Jewell had led negotiations with Chrysler on behalf of the union before a federal investigation revealed that he and other top officials had accepted millions of dollars in trips, luxury goods, car, and even house payments, from the company. The petition says those actions are nothing short of "treasonous" to the guiding ethos of the labor movement. 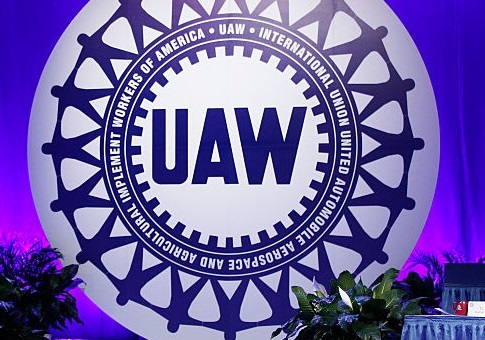 "We the concerned undersigned citizens petition the UAW International Union to remove the convicted, treacherous, felon UAW Vice President, Fiat Chrysler Automobile Norwood Jewell's likeness, photos, name and all reminders from all UAW property in an efficient and expedited [manner]," the petition says. A UAW spokesman declined to comment on the petition beyond pointing to the union's statement following Jewell's guilty plea. The union acknowledged the frustration that members may feel about the news of corruption and bribery among the ranks of top officials, and said Jewell demonstrated "poor judgment." It reiterated its commitment to transparency and "Clean Slate" reforms aimed at curbing similar behavior in the future. "This is a troubling moment for our organization, and our members are appropriately angry and frustrated," the statement said. "Our members will always be our highest authority, and so we pledge to continue to change the way that we do business." "He has no right to be protected, funded and taken care of by the victims of his crimes!" a Kentucky signatory said. A Michigan signatory said that the union should work quickly to purge Jewell, pointing to criticisms from "reactionary right wing forces." The continued presence of corruption would only undermine the interests of workers. He did have a creative idea for how to deal with the portraits since union dues money had already been used to create them. "It is unconscionable that Norwood Jewell and his fellow UAW officers who've already plead guilty would betray our union," the poster, identified as Frank H., said. "His name should occupy no place of honor in our UAW. Instead we should have a special Hall of Shame which should be published in UAW Solidarity out of respect for the membership." This entry was posted in Issues and tagged UAW. Bookmark the permalink.